One of the most fertile periods in recent Danish history was the first half of the 1800s. It was a revolutionary time politically, scientifically and culturally. The first decades proved dramatic as a flood of misfortune struck the nation – the Battle of Reden in 1801, the English bombardment of Copenhagen and the loss of the navy in 1807. In 1813, the state went bankrupt and the economic crisis lasted until the end of the 1820s. The biggest blow to the country occurred when Norway had to be surrendered to Sweden in 1814. Curiously, hardship often gives rise to creativity and innovation and in this regard, these decades were no exception. Within cultural life, there was a burgeoning like never before, and the period has since been referred to as Denmark’s Golden Age. The brightest star on the Golden Age sky was the sculptor Bertel Thorvaldsen, who was the only of the Danish artists to achieve fame internationally. He lived in Rome for forty years and became a kind of father figure for many young Danish artists who went to Italy to study. Thorvaldsen had succeeded in creating for himself a large international clientele, he ran a large workshop in Rome and his extensive activity excited great admiration. At home in Denmark, it was particularly C.W. Eckersberg who gained a major role within painting. He has been called “the father of Danish painting” because he was the first to establish a professional school. After international travels lasting six years, Eckersberg became a professor at the Royal Art Academy in Copenhagen in 1818. A number of his students were the artists we today consider the best of the Golden Age, including Christen Købke, Martinus Rørbye, Constantin Hansen, Jørgen Roed and Wilhelm Marstrand. Even the younger artists who were not direct students of Eckersberg could not avoid his influence. This is the case for painters such as J. Th. Lundbye and P.C. 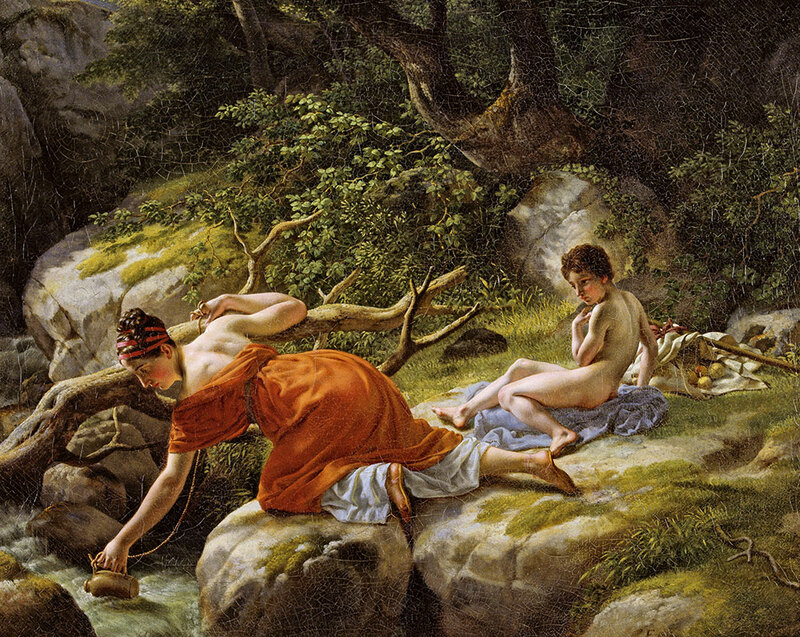 Skovgaard, both of whom were affected by the nationalist romantic zeitgeist in their landscapes. N.L. Høyen was another significant individual who greatly influenced young artists in Denmark. He was the first real art historian in the country and helped delineate the subject as a well-defined science with clear boundaries to history and philosophical aesthetics. Høyen was of particular importance for the nationalist romantic wave in the beginning of the 1800s, when the fatherland was in focus. Høyen argued that artists should paint the landscape and the national monuments at home in Denmark rather than exotic subjects abroad. Golden Age art is marked by a bourgeois outlook on life, and to a high degree, it was also largely the upper classes who purchased artworks, in contrast to previous eras, where it had mainly been the king and nobility. Also characteristic is the meticulous observation of the immediate, private and everyday. Although history painting with biblical and mythological subjects still ranked highest at the Academy, the artists found a greater joy in depicting their daily surroundings, which they did in an objective and sober way. But the greatest innovation in art production at the time was without a doubt plein air painting. Artists began completing their paintings outside in nature in front of the subjects, thereby gaining a whole new freshness and spontaneity in their images and a more intense use of colour. It was Christen Købke, Martinus Rørbye and J. Th. Lundbye, the latter of whom barely lived to the age of thirty. In 1853, C.W. Eckersberg also died during the cholera epidemic in Copenhagen, and thus some of the Golden Age’s most important artists were lost. A new generation of artists took over and set new standards for artistic expression. Simultaneously with this change of generations in the arts, Denmark’s new constitution was signed, thereby ushering in a new epoch. In the case of many of Johannes Hage’s Golden Age paintings, we do not know the exact acquisition date. Some of them were inherited after the death of his parents and some he bought himself at auctions. In contrast, we know exactly when the international paintings were acquired. The reason for this might be that the international collection was more important to Johannes Hage, or it might be because in the period from 1870-1896, he had not yet decided to establish a collection with museum intentions. For this reason, no information exists about a large portion of the Danish paintings’ acquisition history and provenance until after 1896, where his collection of art became more systematic.